Combine all the dry ingredients in your Cuisinart and pulse a few times to combine. Add ice-cold butter pieces and use quick pulses to combine until the butter is in walnut to pea-sized pieces and coated with flour. Combine water and lemon juice and drizzle 3 tablespoons of liquid over flour mixture. Pulse a few times to incorporate into the dough. Squeeze a small handful: if it doesn’t hold together, add more cold liquid 1 tablespoon at a time, pulsing until just incorporated, then test again. Do not overwork mixture, or the pastry will be tough. Turn the mixture out onto a lightly floured surface. Start to press, turn and fold the dough until you have a just cohesive dough that doesn’t fall apart. You don’t want to over mix, but you do need to get the fat nicely distributed and the moisture incorporated throughout – this way the dough will stay together when you’re ready to roll it out. Prepare the pears by thinly slicing them and tossing the pieces in dry white wine or lemon juice periodically so the pears don’t oxidize and turn brown. There is no need to peel – the skins are delicious and pretty! When ready to roll, preheat oven to 375°F. Bring the dough out of the fridge and let sit for a few minutes to make it easier to roll out. Dust the counter with a light coating of flour. Unwrap the dough and, with a rolling pin, soften the dough by hitting it gently, but firmly with the rolling pin. This just makes the dough easier to roll out. Begin to roll out the dough by working from the center and pressing out, turning the dough a ¼ turn with each press – this helps produce an even thickness and shape, as well as to make sure the dough doesn’t stick to the counter. Add more flour as needed – the pastry will only absorb what it needs. Roll until the dough is about ¼ inch thick and about 16 inches around – just eyeball it, no need to measure – this is a rustic galette after all! Once the dough is shaped, roll it up over the rolling pin and transfer it off the pin by unrolling it right onto the baking sheet. Quickly fill the dough with sliced apples – meticulously arrange or just mound them! Leave about a 2-inch border all around to create an edge. Fold the edges over and brush with some of the soaking liquid from the apples. Pop the galette into the pre-heated oven. 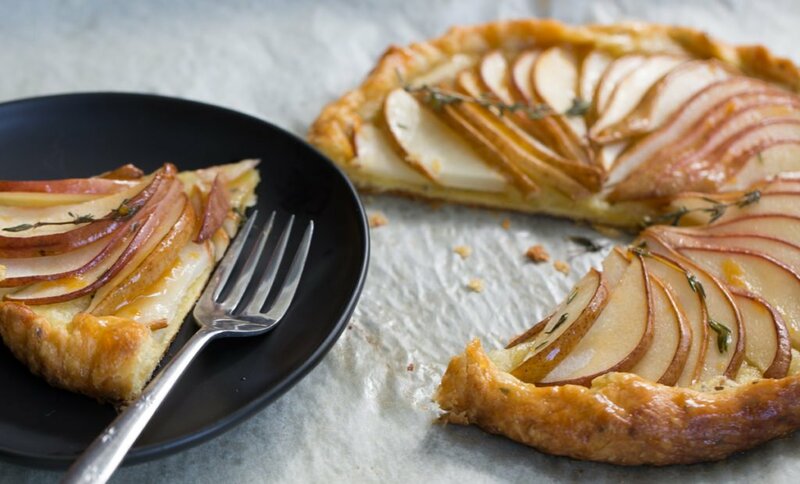 While the galette is baking, prepare a nice glaze to finish it. Combine jelly, white wine and fresh thyme leaves in a skillet over medium heat. Dissolve the jelly and cook until the alcohol is burned off and the texture is like a thin syrup.